Aziza Brahim performs at the Brunswick Music Festival, Brunswick Town Hall on Thursday 16 March at 8pm. 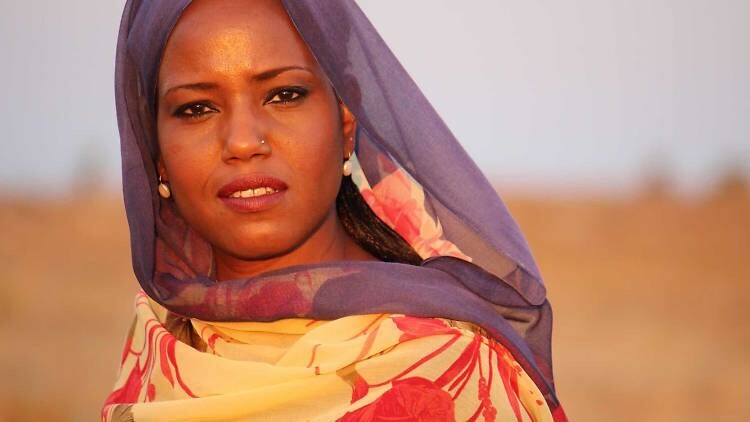 Aziza is both a highly potent sonic poet and the voice of the Saharawi people in their ongoing struggle for recognition and justice. Innovation, truth, humility and political outspokenness are the raw materials of her vision. Georgia Vlassopoulos, chair of AWSA (Victoria) welcomed all those who attended the event to celebrate the Saharawi National Day and said “The Saharawis have used their exile constructively and built a democratic state which could transfer to government of their country. Let’s hope that this chance will come sooner rather than later”. The Polisario Representative, Kamal Fadel thanked all those who attended the event on behalf of the Saharawi people. The event was attended by many members of AWSA and their families as well as the Polisario Representative in Australia. A barbecue was provided and a Saharawi tea ceremony was performed. Australia Western Sahara Association (AWSA) was set up to raise awareness and promote the Saharawi cause in Australia, and to campaign for a free and fair referendum on self-determination for the Saharawi people. 1.15pm: A journalist from Western Sahara tells his story. Sought by the Moroccan occupying forces for his part in a peaceful sit-in, Malainin Lakhal decided to escape rather than face another spell in gaol. Taking refuge with 160,000 other Saharawis in camps near Tindouf, he found he could help get the story out to the world of what is happening in the occupied territory. 12noon-1pm: Western Sahara: violation of Saharawi indigenous rights in the last colony in Africa. Morocco’s 32 year occupation of Western Sahara forced over half the Saharawi population to flee their homes and live in exile in refugee camps in south west Algeria. Those who remained in the occupied territories suffer daily human rights abuses at the hands of the Moroccan occupying forces. What Saharawis want is just to exercise their right to self-determination in accordance with UN resolutions. Why has the plight of Saharawis been ignored for so long? Centre for Australian Indigenous Studies, Monash University, Clayton Campus, room 228, 2nd floor Gallery Building (Building 55). Australia Western Sahara Association (AWSA) hosted Malainin Lakhal, a journalist from Western Sahara, as he toured Australia and New Zealand. Malainin spoke at public meetings in Sydney, Melbourne, Canberra and Perth and in New Zealand. Malainin, an English graduate of Agadir University, was sought by police as a suspected ring-leader of the Saharawi resistance in the occupied Territory. Since 2000 he has been living in the Saharawi refugee camps near Tindouf in SW Algeria, working as a teacher, a translator for the Saharawi Press Service, a journalist and as secretary-general of UPES, the Saharawi writers’ and journalists’ union. Through this work he supports his friends still living in the occupied zones, bringing the human rights abuses they suffer daily to the attention of the world.